Question: What Direction Should Solar Panels Face? Imagine you're in the process of installing solar panels to create a sustainable energy source for your home, school, business, etc. You would want to make sure you place the panels facing in the ideal direction so that they could collect as much solar energy as possible. How could you find out what direction will get you the optimal result? Do the experiment below and you can find out! Fill your empty tissue box with sand. Tape each of the four thermometers to the tissue box, one to each side, with all the bottoms facing the same direction. Tape a layer of plastic wrap over each thermometer using a square of equal size for each of them. Find a spot outside that you know will get sunlight all day. Try to wake up before the sun rises so that you can place your tissue box in this spot. Use your compass to find north, and rotate one side of your tissue box to face that direction. Label this side with an ‘N,’ and make sure to all the other sides with their corresponding directions on the compass. Do this after every hour over the course of the day, until late in the afternoon (or until sunset, if you can wait that long!). Collect your tissue box and make a graph of temperatures using the data you collected. What’s the difference between the highest and lowest temperature thermometers? Is this surprising to you? Are the temperatures the same at dawn and sunset? ﻿What data you get will depend on your latitude and what time of year it is, but if you’re in the United States you should see a higher overall temperature on the thermometer that faced south than the thermometer that faced north. Someone in the southern hemisphere would see a higher temperature on the thermometer facing north. Question: How Do Glaciers Affect the Earth’s Surface? Summary: Glaciers are large masses of ice that move over the surface of the earth in many areas. This experiment is designed to demonstrate the effect of these rivers of ice on the earth beneath them. Put 350 mL of water in the beaker. Add a 1 lb. box of cornstarch and use the spoon to mix to the point where there is very little water standing on the surface of the cornstarch mixture. Place a golf-ball-sized amount of the cornstarch mixture in the center of an 8” square of waxed paper. Observe and note on your paper how the material behaves. Does it flow? This is similar to the way that ice deep in a glacier flows. Draw a diagram of what this glacier model looks like. On top of your glacier model, place another spoonful of the cornstarch mixture. This represents “new snow” that would fall on the glacier during the winter months. What can you observe about any changes in the glacier, and its perimeter? Sprinkle several tablespoons (approximately) of sand, gravel and soil in a band beginning about 1-1/2” away from the outside edge of your glacier model. Use the permanent marker to mark the inside and outside perimeter of the sand/gravel/soil band on the waxed paper. Now sprinkle some more soil on top of the glacier model. This represents loose rocks and soil from the Earth’s surface. Continue by placing successive spoonful’s of the cornstarch mixture on top of the glacier model in center. After each spoonful, mark the new perimeter to see how far your ice cap moved. Observe what happens when the glacier reaches the band of sand, gravel and soil. Stop when you have added enough cornstarch mixture to move your glacier within 2 inches of the edge of the waxed paper. Draw a diagram of your glacier. Compare the thickness of the glacier in the center and at the outer edges. Place a second piece of waxed paper on top of the glacier and carefully turn it over so you can see the reverse side. Measure and record each of the perimeters you marked previously. Observe and draw a diagram of the bottom of the glacier, taking particular notice of the position now of the sand/gravel/soil. Question: Does the Temperature of a Magnet Affect its Strength? Summary: Magnets are used in many devices like refrigerators, audio speakers, and computers. They occur naturally in the earth’s rock. Magnets are dipoles, meaning that they have opposite charges at each end. When magnets are heated or cooled, their molecules become more disorderly. This project identifies the result of this disorder. Set one magnet on the table, so that it reaches room temperature. Bring a saucepan of water to boil, place the second magnet in the pan, and continue to boil for 45 seconds. Place the third magnet in a bowl of ice water for 30 minutes. Place a compass on a flat table so that the needle faces to the right. Tape a ruler to the table so that its direction is perpendicular to that of the compass needle. The “0” on the ruler should touch the “0” on the compass. Start with the room temperature magnet. Slide it along the ruler towards the compass, so that the needle moves toward the magnet. 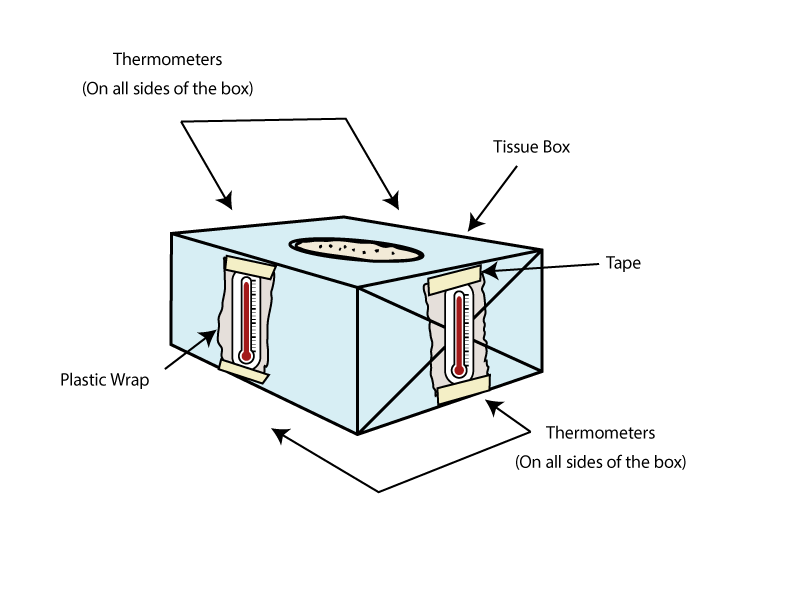 (If it is moving away from the magnet, use the reverse end.) Note the distance between the magnet and the compass when the needle begins to move. Record that distance on your paper. Use the tongs to remove the heated and cooled magnets and repeat the above procedure, again recording the distance when the needle begins to move. Compare the data and reach a hypothesis about the effect of heat and cold on magnets.